Ruth Park (1917-2010), one of Australia’s most popular writers, was born in New Zealand but moved to Australia in 1942 to pursue her career as a journalist. In the same year, she married D’Arcy Niland (1917-1967). 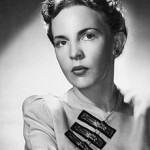 As struggling writers in the 1940s, they lived for a time in the Sydney slum area of Surry Hills, and this period in her life inspired her to write The Harp in the South (1948) and Poor Man’s Orange (1949).